Hired Part Time on Apr 19, 2019. Admin assistant, Data entry and email management is my specialty. I am a communications graduate. I am well-versed in speaking and writing english. 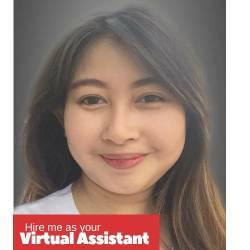 Starting out as a virtual assistant, I was first an article writer. I have a personal blog I created myself that's why I know a lot about blogging. The most favorite role I had was for email, social media and linkedin marketing. I mastered this like an art. As a social media manager I've learned some techniques on how to market. I have almost 2 years experience with this. Because I am a frustrated blogger, I've learned how to manage and customize my blog pretty well.